Our pets are like a part of the family. We love them. We want them safe, happy, and of course, comfortable. With our busy lives, it is sometimes unavoidable that we have to leave our furry children at home, alone. While cats tend to be pretty self-sufficient, dogs may need to be kept in a crate or kennel, when mom and dad leave the house. While this can make you feel guilty, Fido is usually quite content in his home within a home. To ensure the comfort of your pet, extra padding placed inside of the crate is a must. With all the options currently on the market, it can get overwhelming to make the right decision. To help you find the right one, we have compiled a list of the best dog crate beds available right now. If your dog is elderly or has any orthopedic issues, this is the perfect bed for your buddy. Super soft and incredibly comfortable, your dog’s bones will thank you. Filled with sewn-in foam means it will not bunch, offering even support. Well constructed, it also backs itself with a 3-year warranty! Supportive and Comfortable – Featuring a three-inch layer of shredded, memory foam filling, this bed is great for any medium-sized pet but especially for those with arthritis, joint problems, and/or hip dysplasia. Measuring 34” by 22” this comfy insert is compatible with any 36” by 23” kennel, adding the ultimate finish to your pups haven. Easy Clean Up- The zippered, removable, micro suede cover makes clean up a breeze. While this bed is not leak proof, putting a waterproof crib mattress sheet under the beds’ cover should do the trick. If you must wash the filling, placing it inside of a zipper-close pillowcase, and washing as you would any bed pillow will suffice, although doing it frequently, is not recommended. Well Constructed – While this high-quality dog crate bed is durable, if your fur-baby is an extreme chewer, this one may not be for him. Beautiful yet simplistic in design, it is absolutely built to, not only last through multiple cleanings, but years of wear and use. Even large breeds are supported completely, no sinking to the floor! Summary: This bed is a good choice for most dog breeds, it comes in a few different sizes to accommodate any pet, even if they like to sleep all stretched out! Most of those that have purchased these pads are incredibly happy with it, and so are their pets. Check Brindle Soft Dog Bed now from Amazon! This massive pet bed is big enough for both of you to snuggle up together. At 54 inches, it fits snugly in an equal sized crate. It also works well when used as a regular pet bed. Your dog will never want to leave his/her crate again. When shopping for the dog bed for crate, this one should definitely make the list. Home Sweet Home – Many dogs are not exactly crate lovers. They get anxious, so adding an extra layer of comfort can make it more homelike. The warmth of the fleece and surrounding of soft, barrier-like bolsters will keep your four-legged baby feeling cozy and protected. Makes being in their crate much more appealing to your dog! Summary: Well made and durable, this bed will bring your pet comfort for a long time to come. Washing machine safe so accidents are no longer a headache! Help your pup feel more secure when he has to be away from you, while you feel better about his comfort. Check MidWest Deluxe Bed For Dogs & Cats Now From Amazon! This unbelievably thick and super tough, orthopedic pad is probably one of the most well-rounded, top rated dog crate beds on the market today. With a total of four inches of high-quality support in the form of two inches of memory foam sitting atop a two-inch base. It is also encased in 100% waterproof material, guaranteeing it is not only comfortable, but it is also digging/tear free. It fits snugly in the tray of your standard large kennels. Your dog will love you forever for this one! No Pain No Gain? 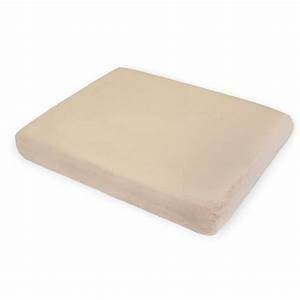 Not Anymore – The orthopedic memory foam pad provides unrivaled support, eliminating joint and pressure point pain. It molds to the contours of your pet’s body, which guarantees even the largest breeds (who are more prone to orthopedic issues like hip dysplasia) have complete support. No more sinking to the floor. Tough Guy – Does your boy like to dig at his bedding? This undeniably strong, dog crate bed is tear resistant, and while not chew proof, it is probably a safer bet than some others, especially if Fido likes to gnaw. Tough and sturdy you are sure to get a lot of use out of this kennel bed. Summary: When it comes to loads of awesome features with minimal drawbacks, this is one of the absolute premium quality crate beds available, especially for the price. Those who have purchased this pad give it rave reviews, and if for some reason you are unhappy with it, that nice little warranty will back you up. 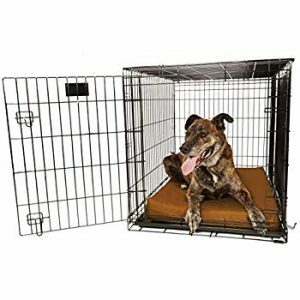 Check Dog Crate Pad Now From Amazon! Featuring a removable, anti-microbial, waterproof, and machine washable non-slip cover, the Milliard Premium Orthopedic Memory Foam Dog Bed is first in its class, not only for keeping your dog comfortable but for everyone’s benefit, it is also incredibly easy to clean. Made to be long-lasting, your dog will get years of use and comfort from this well-constructed and cozy bed. 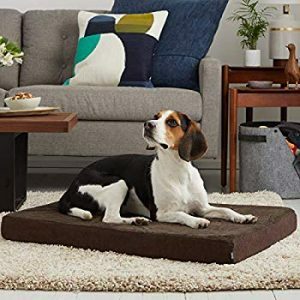 Massive and Snuggle Ready – Made up of two inches of premium, dense, memory foam on top, with a two inch, firm and sturdy base, it provides equal support along the length of, and at all pressure points on your pet’s body. Measuring 46in. X 35in. X 4in., this huge bed will complete your pets, pad (see what I did there? ), transforming their crate into the perfect refuge. Built To Last – Comprised of super thick, tough material, this bed can take a beating from even the toughest puppy. If your dog likes to dig or nest, this bed is virtually tear free. It is NOT chewing proof, however, it can probably take it better than other dog crate mattresses. The removable covering is completely waterproof, and the pad is made to fit loosely inside the lipped tray of the crate, with enough room to catch any runoff. The antimicrobial cover offers an added layer of protection from germs and bacteria. Achy Joints Heaven – The orthopedic memory foam is firm enough to lightly contour the curves and angles of your pet’s entire body. No more uncomfortable days or nights on a cold and hard, plastic or metal tray. It will be a chore to get your fur ball to come out of his new and improved doggy retreat. Summary: This is definitely in the top five of the best dog beds for crates out there right now. Well constructed and sturdy, it will match well with your pooches personality, while also making them feel safe and secure (and clean!). 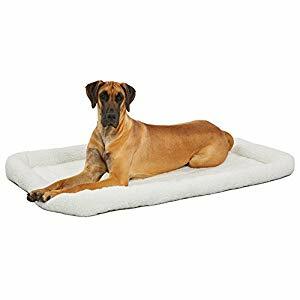 Check Milliard Memory Foam Dog Bed Now From Amazon! Available in small, medium, large, and extra large sizes, you can rest assured you will find the right fit for your pet. Cleaning is made simple with a removable and washable cover. Made of a distinctive combination of memory foam and gel, your four-legged love will find unrivaled comfort when this bed is added to their kennel-home. Make sure your pet is happy and content while you’re away. As an added bonus, receive a surprise with your purchase! Comfort Combo – The unique mixture of memory foam and gel offers sturdiness and support others do not provide. The cover is ultra soft but can withstand any level of use, it is zippered and completely removable to ensure any mess is able to be cleaned thoroughly. Small: 16” X 24” X 3”, for pets that weigh less than 25 lbs. Medium: 22” X 32” X 3”, for pets that weigh less than 45 lbs. Large: 26” X 36” X 3”, for pets that weigh less than 65 lbs. X-Large: 42” X 31” X 4”, for pets that weigh less than 120 lbs. Tip: Measuring your pet’s crate may help ensure it will be the perfect ft.
No Other Quite Like It – With its unique filling and superior handcrafted quality, this dog crate pad certainly outshines all others. It is especially helpful for pets with orthopedic conditions such as arthritis or to help ease the aches and pains that come naturally with aging. Summary: This bed is comfortable and snug, with added leak protection. I can say with confidence that, out of all those purchasable, this is the very premium quality bed that you can buy. Providing superior comfort and complete support, this one is a step above the rest. 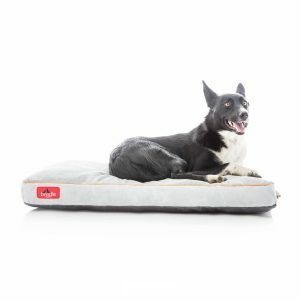 Check BarkBox Memory Foam Dog Bed Now From Amazon! Durability VS Personality – Is your pet a crazy, hyper, super destructive kind of guy? Or a more laid back, chilling all day pup? This is perhaps the most important question to ask yourself as it sets the basis for what you are going to need. Be sure to evaluate your pets personality and his behavior, before making a decision. Is your pup a chewer? – This point is going to be an important one to consider when choosing your dog crate bed. Most beds can stand up against some destruction, but they are not chewing proof. If you have a destructive chewer on your hands, you do not want to buy a thinly covered, super fluffy pillow bed. It will likely be destroyed in one sitting. Your pet may need an extra sturdy bed, like the BarkBox at #5. Throw some chew toys in and hope for the best. Giving your pet toys meant to be exclusively for chewing, may discourage him from destroying his surroundings. Accident Prone? – If your pet is one that tinkles when excited, happy, or just if you look at him funny, you need a crate bed that is cleanable. There are many on the market, some better than others, for puppies and dogs who just can’t help it. Choose the right one, as there is nothing worse than a stinky and dirty kennel that you can’t wash properly. Accommodation – What are your pets specific comfort needs? This seems obvious but you want to make sure that whichever bed you choose makes your pet completely comfortable. Knowing your dog well will play into this because your furry friend can’t exactly tell you what he needs. If he is a young pup, a thin, firmer mattress should be sufficient, however, if he is older, you may need more cushion and support. Overall likability – Face it, you could buy a million dollar, high tech, pet bed that rocks FiFi to sleep every night, yet, if she doesn’t like it, she will not use it. Which, really, defeats the whole purpose. Get to know what makes your pooch feel at home, and what he does not like. Animals, dogs especially, can be incredibly stubborn. When you are a dog lover, you feel the same about them as you do your family (and sometimes, we like our pets more!). You are the one that they turn to for love, guidance and to care for them completely. Of course, we want them to have the best of everything, but especially a dog crate bed. With the amount of time they can spend inside of their kennel, it is important to their well being that they are not uncomfortable, or unhappy. When looking for the best dog crate bed, it is imperative that you keep in mind what your individual pet needs. They all have different personalities and choosing the wrong one can wind up being a headache for you, and your dog.